I’ve just been staring at 97% for over 5 minutes, attempting to install the latest iteration of Photoshop CC (2015.5) and am beginning to wonder a) if it will ever complete, and b) why I bothered, at least until plenty of others had already done so and had time to point up the problems. I wrote the above sentence a couple of days ago, and can happily report that shortly after I’d finished doing so, the installation did complete successfully, though not without leaving me with a few problems. It really shouldn’t be beyond the wit of Adobe to write an installer that copies over the plug-ins from one version to the next – or at least to give us a message reminding us that we need to do so – and opening the relevant folders. But at least this time Photoshop came up looking more or less the same as before, whereas at least one recent update resulted in a quite different workspace and panicking before I found how to select ‘Photography’ at the top right. As well as problems with plug-ins, I’ve also had to sign out of Creative Cloud using Photoshop and then sign back in again. I think also that some of my colour settings have been lost or altered and probably there are a few other problems I’ll come across. I don’t have a problem with Adobe making sure we are paying for their software, but I do wish they had a system that worked without these hiccoughs. It does seem to have been worth doing this upgrade, as Photoshop does seem to be working a little more snappily, keeping up better with my stylus as I move around retouching the black and white scans I’ve been working on. 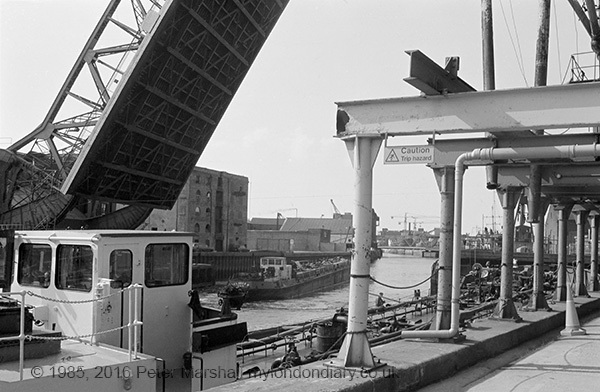 I’ve been working over the last few weeks on scanning some of my black and white negs from the 1970s and 80s in Hull. I’d done quite a few for the Blurb book ‘Still Occupied – A view of Hull’, published in 2011 which has 270 photographs – which you can see in the on-line preview, but I’m intending to put up a web site, and went thought the work again to see if there were images that I’d missed. Retouching the scans took rather a long time, but was made much faster now with the Spot Healing Brush tool than it was when I worked on the earlier pictures using Photoshop 7. And last week my wife asked me for a picture for a card with a Dutch theme, “Something with windmills“. 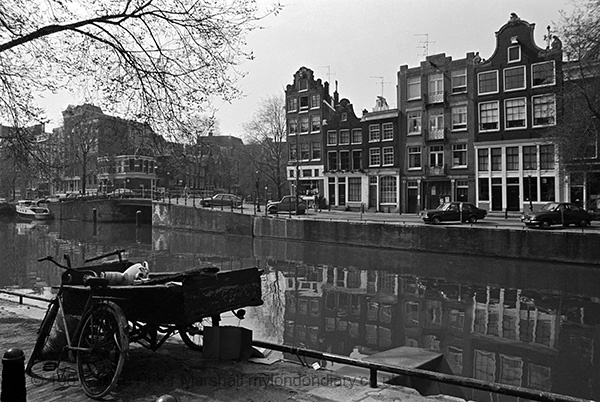 While I do have some pictures from our last visit to Holland in 1981 which would fit, they are are colour transparencies and probably hidden somewhere in the loft; finding, scanning and cleaning up the scans from them would have been something of a challenge, so I went instead for a black and white of a canal in Amsterdam. Looked at on the contact sheet it was fine, but when I opened up the scan sitting on my network-attached storage I found a problem. Like many of my old negatives, this one had suffered greatly from when my storage cabinet in the darkroom had become home to an infestation of minute bugs, who crawled their way across the negatives munching tracks through the gelatin, leaving behind their excreta, dead bodies and body parts. I’d actually seen some of them wandering across negatives in the enlarger, and their mates – or something very similar – would occasionally pop up in the viewfinder when I put a camera to my eye. The faint tracery of their trails was made very visible in the dark areas of the images, and the effect differed greatly from frame to frame, even on the same strip of film. This one was so bad that I’d actually abandoned all hope of rescuing it using Photoshop 7, where the most effective retouching method was the clone tool. But although the scan is by no means perfect I was able to rescue it to a usable level with around half an hour of work, mainly with the Spot Healing Brush in content-aware mode. One thing I’d really like Adobe to improve in Photoshop is the Dust & Scratches filter, which seems rather better at removing detail and sharpness than dust spots or scratches. Fifteen or so years ago I installed the Polaroid plugin filter that did the same job, but rather more effectively. Unfortunately that 8-bit filter no longer seems to work in recent versions of Photoshop. I don’t need most of the other new features, but I’d certainly welcome a better version of this. There are no adverts on this site and it receives no sponsorship, and I like to keep it that way. But it does take a considerable amount of my time and thought, and if you enjoy reading it, the occasional small donation – perhaps the cost of a beer – would be appreciated. This entry was posted on Thursday, June 23rd, 2016 at 02:43 pm and is filed under Uncategorised. You can follow any responses to this entry through the RSS 2.0 feed. You can leave a response, or trackback from your own site.